One of my ongoing personal projects is discovering good techniques and tools for teaching math, science, and a problem-solving mindset to our two elementary school-aged kids. 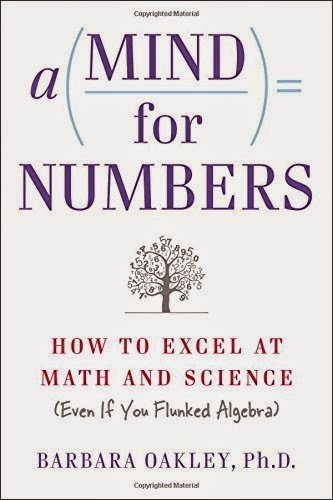 To that end, I recently read Dr. Barbara Oakley's excellent book: "A Mind for Mathematics: How to Excel at Math and Science (Even If You Flunked Algebra)." Dr. Oakley's own story is inspiring. She transformed herself from a math-phobe into a professor of engineering. This book is not your usual anecdotal self-help book. While the tone and writing are very casual, the material is completely scientific. All the information is based on the latest brain research, and the book includes a comprehensive bibliography. I did not need to read the underlying psychology and brain research papers to see the truth of what Dr. Oakley wrote. I found myself reflecting on my own successes and failures in learning. I’ve always considered myself naturally talented at math. I ended up with a BS in Mathematics. However, there were a few mathematical subjects that confounded me, most notably Linear Algebra. In retrospect, I saw that I lost the thread of understanding on Linear Algebra right from the start. After those early frustrations I established a fixed mindset and convinced myself that I just wasn’t any good at “matrix math.” In graduate school I worked very hard to pass a Numerical Methods qualifying exam. Numerical Methods makes extensive use of Linear Algebra. However, I was doomed by my lack of understanding of the underlying theory. As hard as I worked at memorizing and mastering techniques for solving the problems, I was helpless to apply those techniques to new or even slightly different problems. I needed to start from scratch and build up, but by then it was too late. Only now, many years later, can I see my mistakes. Dr. Oakley’s book inspired me to apply her techniques to learning something new. I'm working on learning a new programming language (Python) and a new subject (Machine Learning). I recently finished Andrew Ng's Machine Learning course on Coursera. Now I’ve decided to master Linear Algebra, which is key to gaining a deeper understanding of Machine Learning (ML). While waiting for my Linear Algebra course to begin, I enrolled in Dr. Oakley's Coursera course Learning to Learn. The class covers the same material as her book, but takes time to expand many of the concepts. Dr. Oakley’s book should be required reading for anyone with a brain. I plan on having both of my kids read this book some time during middle school. You can find my book review on Good Reads.